How Obama's best economic policy of 2009 cost us ... exactly nothing. In a year when the government enacted one of its largest-ever stimulus bills, guaranteed hundreds of billions of dollars in bank debt, bought hundreds of billions more in mortgage-backed securities, took 60 percent ownership of one car company and put up billions in financing for another, it’s not obvious why you’d dwell on an initiative that basically cost nothing. I nonetheless submit to you that the government’s stress tests—an eight-week effort to vet the balance sheets of the country’s biggest banks—was the single most consequential economic policy of 2009. Granted, it certainly didn’t feel that way at the time. When Treasury secretary Tim Geithner announced the stress tests back in February, they didn’t even register as one of the three most talked-about initiatives in that speech. 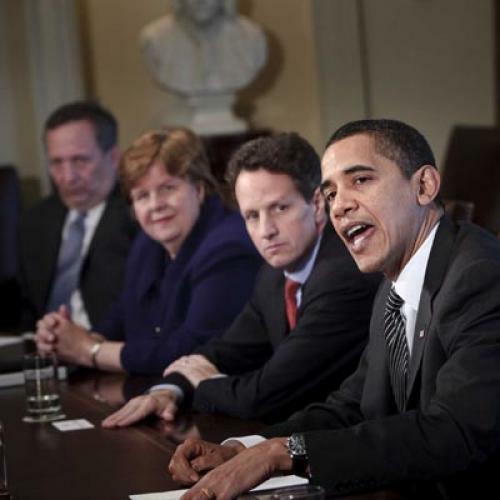 The market and media reaction focused on Geithner’s plans to improve the availability of credit, stabilize the housing market, and help banks offload toxic assets. The Wall Street Journal’s initial write-up didn’t mention the stress tests until paragraph 14 of an 18-paragraph story. And whatever attention the stress tests did attract was promptly lost amid the palpitations of the next several weeks. Bank stocks plummeted 40 percent in the month after Geithner’s speech. Most commentators attributed the free-fall to confusion over how the toxic-asset plan would work, and to investor concerns about a government take-over of troubled banks. Then, as the Obama administration dispelled the nationalization rumors and Geithner forked over more details, the market rebounded sharply. Unbeknownst to most of us, though, an elite corps of nearly 200 Fed “examiners” had started poring over the banks’ books in mid-February. (The ho-hum title isn’t impressive because it doesn’t have to be—in their own way, the “examiners” pack the same implicit threat of hell-to-pay as, say, Harvey Keitel’s “Cleaner.”) The idea was to make a series of pessimistic assumptions about the next two years—slow GDP growth, high unemployment, a languishing housing market—then use the banks own models to figure out how their assets would fare under that scenario. Any bank without enough cash to plug the hypothetical losses would have to raise money from investors. Any bank that couldn’t do that would get another strings-attached infusion from the government. May 7 was the day Treasury chose to announce the results. The run-up to that date produced two things in abundance: 1.) Newspaper leaks, the general thrust of which was that the banks were fairly healthy as a group, with the exception of a few hard cases. (As May 7 approached, the leaks increasingly focused on how these banks were haggling with the government for a better grade.) 2.) Skepticism about the utility of the whole exercise. Yves Smith, a prominent financial blogger spoke for many of the skeptics when she complained that “there was no independent verification of the quality of the accounting” and slapped Geithner for letting the problem banks roll him. If one takes the market as the final arbiter—and, obviously, caveat emptor there—then the leaks trumped the worriers. A widely followed index of bank stocks jumped almost 20 percent on April 9, the day the early leaks hit the financial pages. That index has mostly climbed ever since, including a big surge the day the government released the stress-test data. The results showed that the 19 banks were collectively short $75 billion in capital, $65 billion of which was concentrated in just four institutions: Bank of America, Citigroup, GMAC, and Wells Fargo. Within a week, the banks had raised some $20 billion from investors thanks to rising confidence in the financial sector. The Journal reported this week that the banks had raised $136 billion in stock since May. Of course, just because the banks have recovered doesn’t mean the stress tests are the reason. The market did respond well when Geithner’s other major bank initiative, a partnership between the government and investors to buy the banks’ toxic assets, started coming into focus. That was partly because the government planned to offer generous financing to investors, which would have helped bid up the assets and strengthened the banks’ finances. What people like Smith and me missed was the power of transparency. We worried that the government would have a big incentive to fudge the numbers, because the consequences of pronouncing any bank a failure would be too grim to contemplate. We didn’t realize that there was only so much fudging the government could get away with given the detailed information it was making public. The stress test report broke down losses for each of the 19 banks across eight asset classes (mortgages, credit cards, mortgage-backed securities, etc.). A leak suggesting that one or more of those numbers had been fabricated—and there was no shortage of leaks—would have discredited the entire exercise and possibly sent the financial sector into another funk. The level of specificity also assuaged investors in more direct ways. During the initial phase of the crisis, the Bush administration forced all the major banks to accept government support so there wouldn’t be a stigma associated with it. (Stigmas can pose existential problems during a financial crisis.) That was arguably the right move at the time. The problem is that, as the months went by, lumping all the banks together made them all look equally shaky in the eyes of investors. As Yale economist Gary Gorton notes in his much-acclaimed paper about post-modern bank runs, investors who don’t know where the land mines are buried simply mark down everything during a panic. The stress tests solved that problem by differentiating between the sick and healthy, and offering reams of data to back it up. This restored confidence in the majority of banks that were being dragged down by the wheezing minority. Finally, the transparency did a lot to discipline the banks themselves. Investors knew how much a Citigroup or a Bank of America had to raise in order to satisfy its government overseers, and they could chart the progress with nothing more sophisticated than a balky Internet connection. That focused the minds of the problem banks. Citi redoubled its efforts to sell off too-risky assets on its too-large balance sheet—last quarter it offloaded a Japanese brokerage and consumer lending businesses in Norway and Portugal. Bank of America recently conducted its own government-style stress test to gauge the health of its subsidiaries. In the end, the stress-tests were a nice metaphor for Obama administration economic policy writ large: The communications aspect was a bit muddled—who outside Wall Street has more than a vague idea of what they entailed? The macro forecasting was a bit off--the stress test’s pessimistic scenario assumed unemployment would average 8.9 percent in 2009; the actual number will be at least 9.2 percent. But the tests and their aftermath were well-thought through--top officials like Geithner, Larry Summers and Christie Romer spent hours gaming out every possible scenario (including a meeting during Passover that ran so long Geithner’s special assistant passed out matzah to stave off starvation). And, most importantly, they backed us away from the brink of disaster. Not bad for a policy that cost about $787 billion less than the stimulus.